1. Sprinkle chicken breasts with seasoning salt. Let sit for 5 minutes. 2. In the meantime, line a microwave safe plate with several paper towels. Place bacon on top and cover with more paper towels. Cook for about 4 minutes until bacon is crisp. Blot well, cool slightly and crumble. Set aside. 3. Add mushrooms to a small bowl and cook in the microwave for 1 minute to soften. Set aside. 4. In a small bowl, mix together mustard, honey, mayonnaise, yogurt and dried onion flakes or scallions. Set aside. 5. Coat a large nonstick pan with cooking spray. Add oil and heat. Place chicken in pan and saute over medium heat for 3 to 5 minutes per side until browned. Move chicken to an baking dish that has been coated with a little cooking spray. 6. 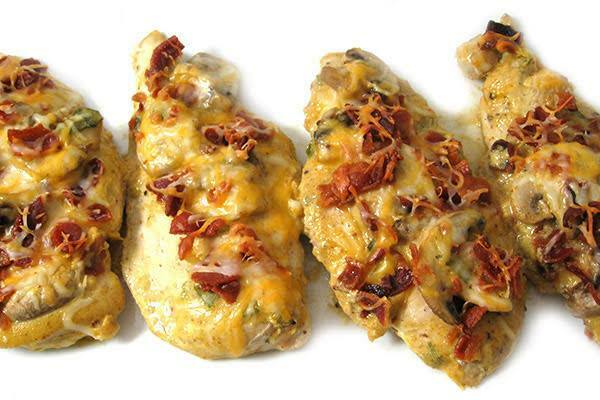 Spread most of the honey mustard sauce over each chicken breast, then layer each piece with the mushrooms, top with the remaining honey mustard sauce, sprinkle each with crumbled bacon. Finally, top each with 1 tablespoon shredded cheese. 6. Bake in a 350° oven for about 15 minutes, until cheese is melted and chicken is done.